Once upon a time, Tom Holland was best known for starring in the stage version of Billy Elliot and the 2012 disaster flick The Impossible. Of course, that all changed when the British actor appeared in Captain America: Civil War, donning the iconic Spider-Man suit to fight against Steve Rogers at Tony Stark's behest. Marvel fans everywhere thought Holland absolutely killed it as Peter Parker, and they also agreed he looked absolutely ripped as everybody's favorite web-slinger. But how did he physically transform into one of the world's most famous superheroes? It certainly wasn't easy, but if you're looking for all the details of the latest Spidey's behind-the-scenes workouts, you've come to the right place: we've rounded up every available detail of how Holland hit the gym. Whether you're hoping for your own Spider-bod or simply curious, here's everything you need to know about how Tom Holland turned himself into Spider-Man. Unlike a certain actor who's best known for playing Star-Lord, Tom Holland was in great shape long before landing the role of Spider-Man, and that's largely thanks to his background as a dancer. Holland started taking hip-hop lessons at Lynn Paige's Nifty Feet Dance School in Wimbledon, England when he was just a kid, showing up for class every Saturday. In 2006, when Holland was just ten, a talent scout went to one of his performances and said Holland should try out for the play Billy Elliot the Musical. It was a suggestion that would change the kid's life. But before Holland could land the title role, he'd have to do some pretty intensive ballet training. He studied the art for two years, auditioning for the play eight times along the way. Talking to Interview, Holland explained he was initially "too small" for the role of Billy, but thanks to the hours he spent practicing ballet, he "got slightly bigger" every time he showed up for an audition. Eventually, he snagged the lead role and debuted as Billy in September 2008. He danced onstage for almost two years, performing some crazy moves throughout his run, like walking up a wall and performing a backwards flip, which sounds like exactly like something Peter Parker might do. In addition to helping him get bigger, Holland's dance background has really aided him as an actor. "I'm very happy I had that training," he explained. "It's been so valuable to my career, and I've used it on almost everything I've done since." Every Avenger has his or her particular skillset. Iron Man flies. Black Widow does martial arts. Spider-Man climbs walls, does flips, and makes Olympic gold medalists look like old men. Of course, Peter Parker got his acrobatic skills courtesy of a radioactive spider bite. Tom Holland, on the other hand, gained his gymnastic abilities after years of hard work, dedication, and risking his neck. If you visit Holland's Instagram page, you'll find countless videos of this guy flipping through the air like some sort of English ninja. He bounces off trampolines, soars through backyards, and wows everyone at the gym. In 2015, the actor was even gifted an AirTrack mat (see the video above), which Holland describes as "a huge bouncy castle that you can bounce around in in your garden." Holland is also into free running, a form of parkour that emphasizes "creative expression." In other words, it involves a lot of acrobatics, not to mention some semi-dangerous stunts. Speaking with Metro, Holland once explained, "Me and my mates go free running all the time….I've probably jumped four meters [13 feet] on to grass and two meters [6.5 feet] between buildings." Understandably, his mom isn't crazy about this particular hobby. In addition to keeping him agile and limber—which is essential if you're going to play the wall-crawler himself—Holland's gymnastic abilities might've helped him land the role of Spider-Man in the first place. During the audition process, Holland had to film himself performing certain scenes, and he would always begin his tapes by somersaulting into the frame, hoping to wow the head honchos at Marvel. And as Holland is the guy currently wearing the Spidey suit, it looks like his acrobatic skills paid off. 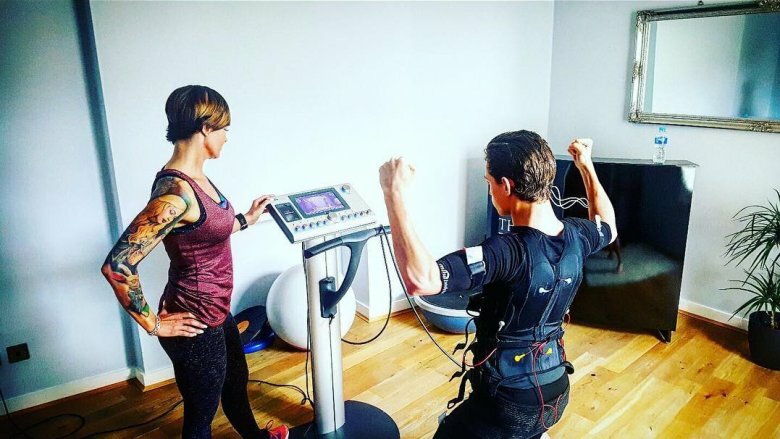 In May 2016, Holland uploaded a video to Instagram that showed him working out with his friend and Spider-Man: Homecoming assistant Harrison Osterfield. In the video, Holland is sporting an elevation mask, making him look like mini-Bane, and he's working up a nice sweat with a little circuit training. That's where you perform multiple exercises, like burpees or bicep curling, one after another, with almost no rest (if any) in between stations. According to WebMD, you generally want to perform eight to ten activities—mixing both aerobic and muscle-strengthening exercises—and in total, you want the workout to last from 20 to 30 minutes. Or you can use the power of editing, like Holland does in the video above, and get it over a lot quicker with fast motion. As for the elevation mask he's wearing, well, those are a tad controversial. Supposedly, these devices simulate training at high altitude. Why would you want to do that? It produces extra hemoglobin, which in turn carries more oxygen throughout your body, improving your cardio. However, while some athletes swear by these things, there are quite a few studies showing they don't actually work all that well. So if you're hoping for a Spider-Man physique, maybe you should just stick to the circuit and pass on the mask. If you want to be an Avenger, sooner or later you're going to throw down with some bad guys. And if you need to trade blows with Chitauri soldiers or a winged Michael Keaton, then you'll need to know a martial art or two. Luckily, Holland is big into combat sports. Not only is he an MMA fan, showing up at UFC events, he also spends quite a bit of time in the gym, learning all he can about the sweet science. Based on his Instagram posts, it seems like Holland does a lot of his training at Miguel's Boxing Gym in Brixton and Church Street Boxing in New York. Both are pretty impressive institutions. GQ named Miguel's one of the best boxing gyms in London, and Church Street has worked with some incredibly high-caliber fighters, like boxing legends Evander Holyfield and Lennox Lewis, not to mention UFC star Chris Weidman. As a result, Holland totally knows what he's doing when he pulls on a pair of gloves. The actor stays fit and ready to fight by beating on a heavy bag and working pads with stuntman Holland Diaz. He also practices on a double end bag for accuracy and rhythm, and the man can't help but slug every speed bag in sight. So if Sylvester Stallone ever wants to reboot the Rocky franchise, maybe Tom Holland is the guy to call. With the exception of Rainn Wilson in Super, you really can't be a schlubby superhero. After all, the moment you don a mask and declare war on crime, you're going to need some well-developed muscles to pulverize supervillains. Plus, you don't want to look bad in that skin-tight outfit. 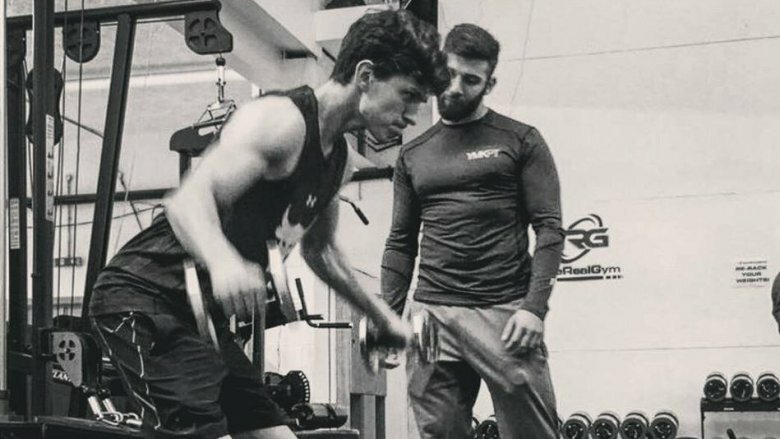 So to get in marvelous shape for the MCU, Tom Holland joined forces with Yousif Madhi, the director at YMK Personal Training. Madhi has been involved with the sports and health world since 2011, and under this guy's guidance, Holland has turned his body into a Vulture-smashing weapon of mass destruction. To get in shape, Holland has exercised his arms and shoulders with every move imaginable, from chin-ups to side lateral raises. Hoping to build biceps and improve his cardio, he also "borrowed Thor's hammer" to beat on some massive tires. Holland also impressed his Instagram followers with this incredible move that probably left his shoulders and legs in serious pain. However, Holland still wanted to take his training one step further, and since he couldn't find a radioactive spider to give him super-strength, he decided to try the next best thing. Let's just get this out of the way first. Electronic Muscle Stimulation (EMS)—like elevation masks—is a bit controversial. In fact, there are studies saying that it doesn't really work. But if you were to ask Tom Holland, he'd give you a totally different answer. Not only does the young actor believe in the benefits of EMS, he claims the technique is "working out really well." So what exactly is Electronic Muscle Stimulation? According to Men's Journal, you put on a suit that's hooked up to a machine. It covers key areas of your body, like your legs, arms, and torso. Then the machine starts zapping your body with electricity, causing your muscles to contract a whopping 80 times per second. And as you're getting fried, you're supposed to follow along with an on-screen avatar, copying its moves as your muscles twitch like mad. As to what it feels like, Holland's described as "20 minutes of absolute hell." After he tried the process for the first time at Body Shape Studios in London, he couldn't even walk the next day. But Holland has stuck with EMS, and believes it's really helped his muscular definition. And if Spidey's abs have anything to do with this shock therapy, it might be worth a little pain and suffering. With a background in dancing and gymnastics, not to mention his fondness for boxing and working out, it's no wonder that Tom Holland looks absolutely ripped as Spider-Man. Sure, he's not as gigantic as some of his MCU co-stars (e.g. Chris Evans and Chris Hemsworth), but then, he doesn't need to be a super soldier or thunder god. Instead, Holland is a lean, mean, wall-crawling machine who's achieved a fantastic physique that's just perfect for Peter Parker. His hard work and dedication as seen in the video above—where he's working with everything from battling ropes to kettlebells—has definitely paid off. Whenever Tom Holland swings into theaters, audiences are sure to agree this friendly neighborhood Spider-Man is truly amazing.